There are 3,000 homeowners in the Santa Fe Fireshed that includes a sensitive and highly populated Wildland Urban Interface zone. The maps that follow show most of these homes to be located in areas of high or extreme risk of wildfire. A catastrophic fire in this area could result in significant loss of life, cost tens of millions of dollars to fight, destroy irreplaceable historic assets and cause over a billion dollars in lost property value. 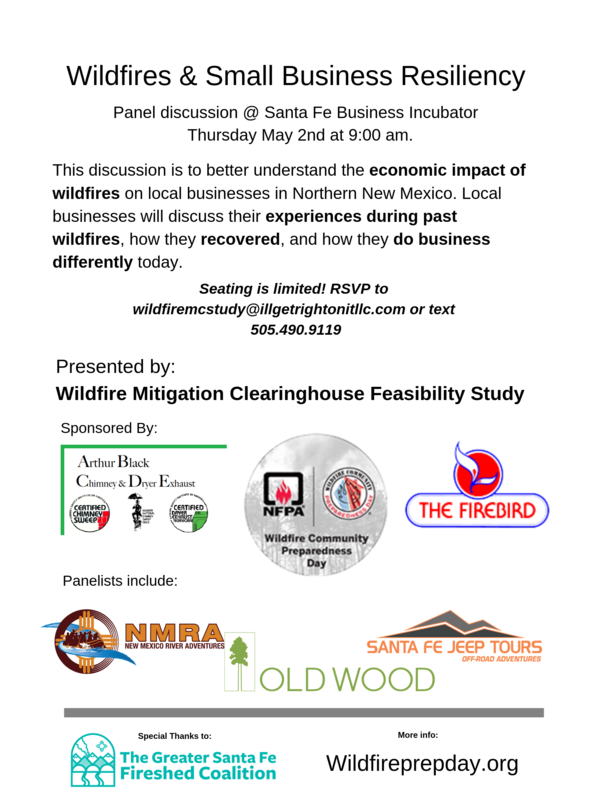 Purpose: to facilitate development of policies, educational materials, marketing plans, public awareness of wildfire risks, small business directories, and private/public partnerships needed to address the threat that catastrophic wildfires pose to the greater Santa Fe area. Government agencies and community coalitions currently address forest wildfire mitigation in association with funding programs that measure results in terms of acres cleared. Therefore, nearly all clearing and burning efforts occur on large tracts of public land that contain few people or private residences. While these valuable efforts reduce the risk of a devastating wildfire reaching inhabited areas, untreated inhabited areas remain highly susceptible to devastating consequences should an uncontained wildfire make its way to the Wildland Urban interface zone. Given forecasts of intensifying extreme drought conditions due, in part, to global warming which shows no signs of abating, we believe that our community’s emergency preparedness plan should incorporate proactive measures to protect these dangerous areas. 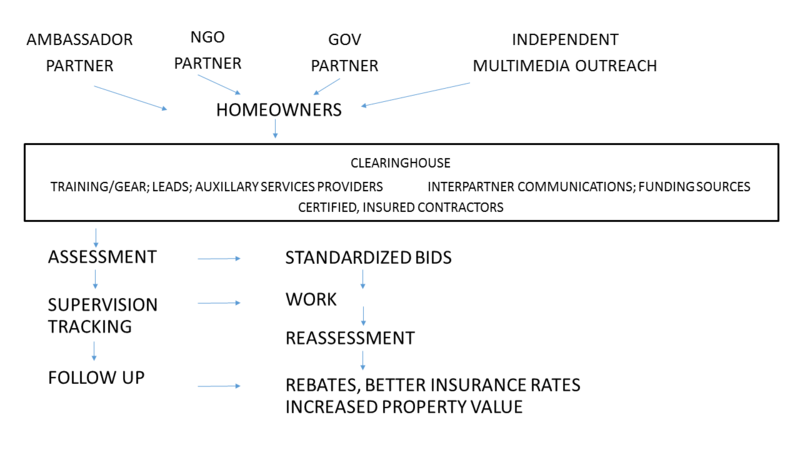 To be successful, emergency preparedness needs to include all involved (see stakeholders diagram), with a special emphasis on homeowners taking a proper measure of responsibility to protect themselves. 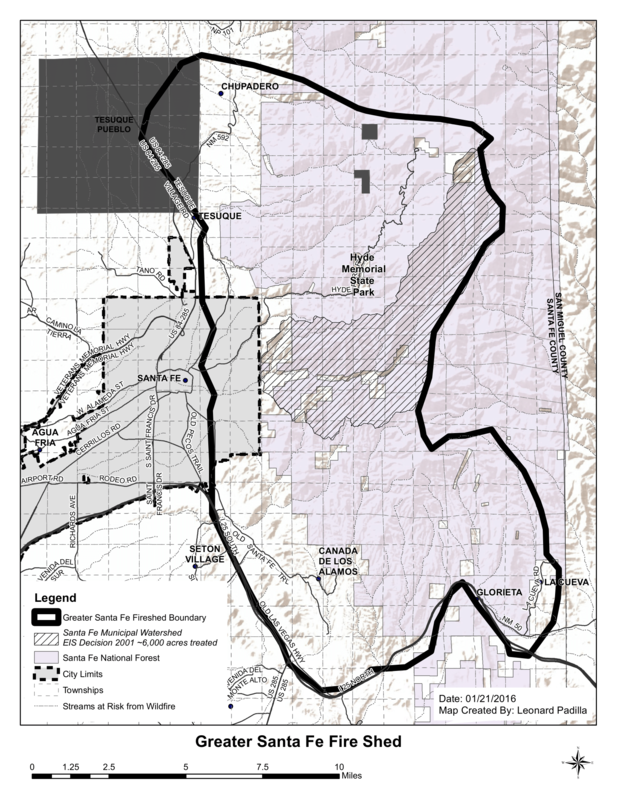 We propose to assess the viability of a public / private clearinghouse that would connect small private landowners in the Wildland Urban Interface zones of Santa Fe with the knowledge, connections and resources they need to undertake coordinated brush remediation that would result in a substantially decreased risk of community disaster by wildfire. Wildfire Mitigation Clearinghouse will facilitate the development of policies, educational materials, marketing plans, public awareness of wildfire risks, small business directories, and private / public partnerships needed to address the threat that catastrophic wildfires pose to our community. The Feasibility Study will be evaluated based on the identification, research, analysis and communication to stakeholders on these topics: the total Private Acreage of that area, Public Support; Slash Commercialization; Potential for Statewide Application. The core final deliverable will be the compilation of all supporting deliverables as outlined in detail in this proposal. The publication will be used to educate stakeholders and secure funding, especially incentive funding, through planned follow-on efforts to the initial one-year grant period. This project is a public / private partnership which relies on the support of foundations, government agencies, businesses and concerned individuals. Click the call to action button to find out how you can support this initial phase. 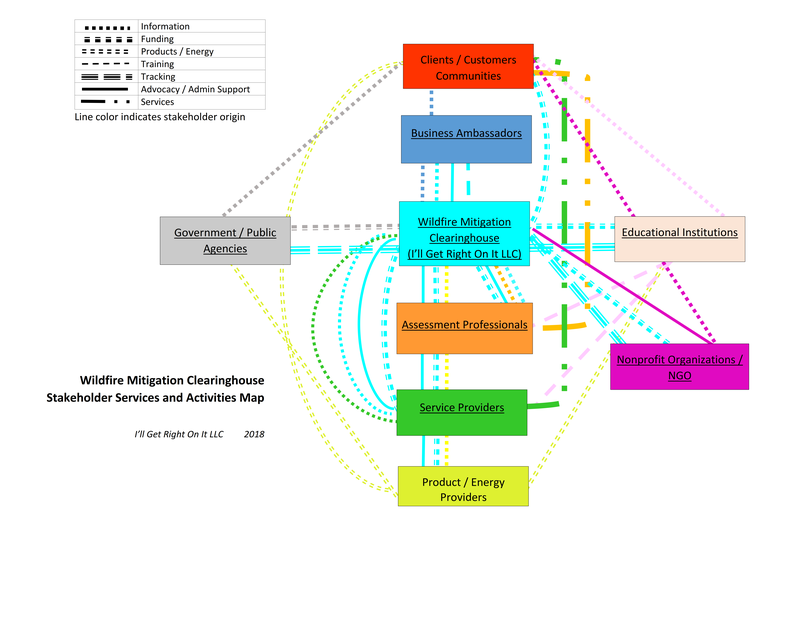 Please select "Wildfire Mitigation Clearinghouse Feasibility Study" as your designation.